[ACT](VC)[1/Turn]:[Soul Blast (1) & Choose a card with "Hammsuke" in its card name from your drop zone, and put it on the bottom of your deck] Choose up to two of your rear-guards with "Hammsuke" in its card name, they get [Power]+4000 until end of turn, and at the end of that turn, retire those units. [ACT](VC):[Counter Blast (1)] This unit gets [Power]+4000 for every two of your rear-guards with "Hammsuke" in its card name until end of turn. Why they would support the hamsters and not even give their own G Unit alongside this new Grade 3 for them is beyond me, but there you have it. Both his skills are ACT and good only on VG circle, so if you wanna use this, no Stride 4 U. Soulblast 1 once per turn to give two Hammsuke rear-guards 4k at the cost of retiring them at the end phase, and his second skill? Counterblast 1 to give him 4k for every 2 Hammsuke rear-guards you have until end of turn. Phoeniciax already ought to cover you for the first skill and his second skill isn't entirely relevant sounding unless you're desperate and can't Stride. Only real advantage I can think of is at least he has synergy with the new G Guardian. Sorta. If you need stuff dead for +0 transactions, then Bigbelly with the G Support or Tester Fox builds will serve your needs better without needing to force deck selection choices. Bushiroad's bringing back more Oldguard, this time for Great Nature. I wanna like this card, but I feel like this unit needed a rearguard skill, because Hammkichi is gonna be vanilla, except if A) you went first, B) it's super late-game and you ran out of resources to Stride effectively, and C) if your opponent doesn't ride to Grade 3. Hammkichi recycling units is nice utility, because it lets you loop units back in longer matches where there's the risk of running out of Hammusukes to add to hand *coughAngelFeather*. Also, dedicating space for a Legion shoves out Hammusuke support. Looking at the broader picture, you could use 4 Bigbelly with your 4 Hammkichi and ride Bigbelly if you're going second, since none of the Hammy support requires a Hammy vanguard. You could run Chatnoir as a backup too, but you might not want to dedicate space for Mikesaburo in your deck to set up for the breakride. 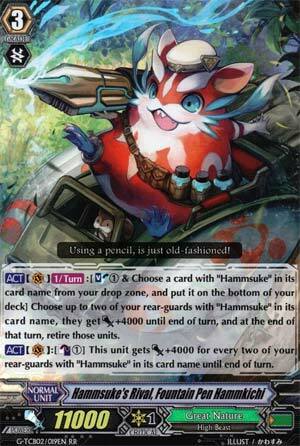 I suppose Hammkichi has a good niche against G1 Rush, but being a counter to a gimmick deck isn't really a positive. TL;DR ride into Hammkichi if you had the first turn, and ride into anything else otherwise.